The ISS Canary Wharf Squash Classic, a world ranking PSA Five Star tournament, is now in its fifth year and continues to grow in popularity and is highly recognised as one of the key events within the annual programme of Arts & Events at Canary Wharf. This competition of world class players takes place in the unique setting of the East Wintergarden, Canary Wharfs prestigious events venue within the heart of the Canary Wharf, with views overlooking Jubilee Park and the waterfront promenade. Canary Wharf is delighted once again to be hosting this great sporting event. The tournament welcomes all, and attracts a large number of squash fans, Canary Wharf tenants and the local community bringing them all together for this highly competitive and top class squash contest, where some of the world’s top ranking players battle it out for the ISS Canary Wharf Squash Classic Trophy. We invite you to sit back and enjoy a feast of great Squash matches within our stunning East Wintergarden venue. Thank you to Eventis, ISS, Squash UK and all the other sponsors for their continued support of this fantastic tournament at Canary Wharf. For more information about the Canary Wharf Arts & Events 2008 programme, please visit www.mycanarywharf.com or be the first to find out by joining our free mailing list, email us at arts&events@canarywharf.com. 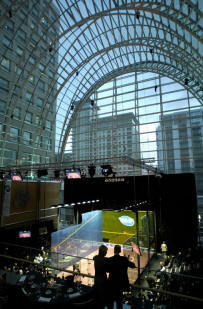 I would like to extend a warm welcome to all connected with the ISS Canary Wharf Squash Classic 2008. Both personally, and on behalf of ISS Facility Services, once again I am delighted that we are the title sponsor of this premier event. Each year, the event has grown in stature and it is a privilege to be involved with the tournament promoters, Eventis Sports Marketing and SquashUK. Once again the quality of the competition looks set to produce some exciting matches and as always we can look forward to welcoming some new names to the list of players. ISS are proud to be associated with such a young and dynamic sport. The extraordinary physical effort and skills of the players is a testimony to their commitment to the sport. Sponsoring this prestigious event continues to form part of ISS Facility Services’ commitment to the Business Community in London and more specifically the City and Canary Wharf. As with the dynamic sport of squash, ISS Facility Services is constantly innovating to provide integrated service solutions to our business customers throughout the UK and around the World. We wish every participant the very best of luck, and hope that you - the audience - enjoy the event at this wonderful venue. The ISS Canary Wharf Squash Classic is now in its fifth year and the team of promoters are delighted to have established one of the major ranking tournaments on the PSA world tour. The ISS Canary Wharf Squash Classic is a joint promotion between Eventis Sports Marketing and SquashUK and all four partners, Peter Nicol, Tim Garner and Angus Kirkland (Eventis) and Alan Thatcher (SquashUK) are grateful for the support and substantial backing from our Title Sponsors, ISS Facility Services, London Division. Our Host Sponsors, Canary Wharf Group plc, provide a superb venue at the East Wintergarden which is perfect for viewing squash and also provides excellent facilities for corporate hospitality. Canary Wharf Group plc also provide outstanding support for the tournament in a variety of areas to enable us to showcase the world’s leading players in such attractive surroundings. We know how much the players enjoy visiting Canary Wharf and we also know that they provide outstanding entertainment for audiences which grow in numbers each year. All the ingredients are there for another exciting tournament which once again will be broadcast worldwide on TV.